Miami has been called the most northern of Latin American cities, and it is easy to understand why. Cruising along the beach with the azure sky sparkling overhead, the beat of salsa music pouring out of bars and cafes, and the lilt of Spanish conversations swirling all around, it is easy to imagine yourself on some exotic tropical island. Miami encompasses an amazing diversity of neighbourhoods. From the picture postcard views of South Beach, where the young and beautiful congregate, to the elegant boutiques of Coral Gables, the laid-back, bohemian streets of Coconut Grove, and the music pubs of Little Haiti, you are never at a loss of places to visit. And when you have had your fill of city excitement the Florida Everglades are only a short distance away, teeming with flamingos and alligators! The one neighbourhood that every tourist must visit is Little Havana. Miami is home to a very large Cuban community and Calle Ocho is where they come to shop, eat, and celebrate every important occasion. A favourite place to eat is the Versailles restaurant, self proclaimed to be the "World's Most Famous Cuban Restaurant". On weekends,large family groups gather here to eat, gossip and linger over endless cups of Cuban coffee. The decor inside the restaurant is inspired by the palace it is named after, with wall-to wall mirrors, chandeliers, and lots of gold gilt. 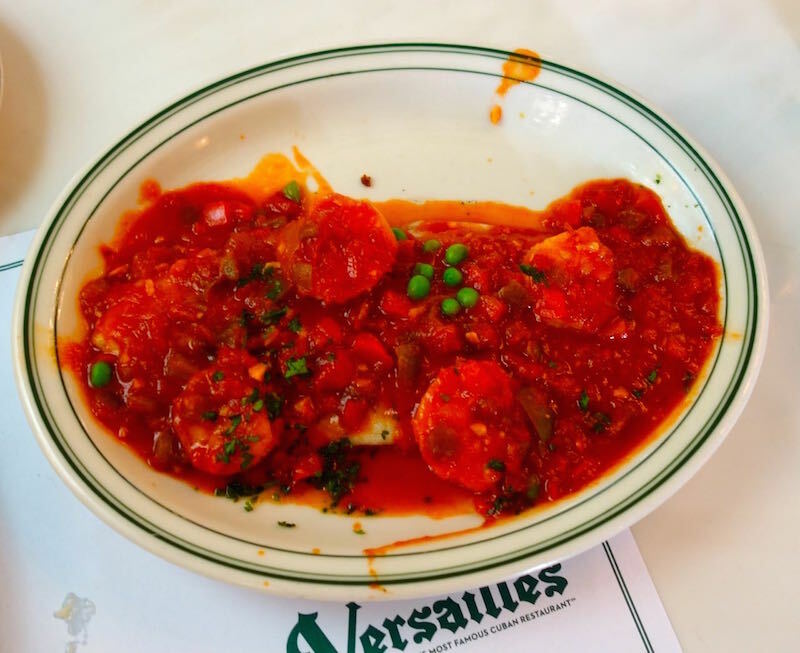 The food at Versailles restaurant is authentic, well prepared and delicious! We sampled a variety of their seafood and pork dishes, washed down with cups of strong Cuban espresso. Cuban cuisine is a pleasing mix of Spanish, French, African and Caribbean culinary influences. Simply cooked for a long time over low heat to let the flavours develop, it is lightly spiced with cumin, oregano, garlic and pepper. Serve this delicious shrimp dish with diced avocados tossed with lemon juice, fresh parsley and red onions as well as black bean rice on the side. Warm oil and butter together in deep skillet set over medium heat. Add onions, peppers and garlic. Sauté, stirring occasionally for about 8-10 min until onions are softened and lightly browned. Add fresh coriander or parsley, all the spices and salt. Cook for 1 min. Add wine and simmer for 2 min to reduce. Add water and tomatoes, cover and bring contents of skillet to a gentle boil. Reduce heat to low and cook for 10 min until sauce is slightly thickened. Add shrimp, stir to mix, cover skillet and cook for 6-8 min or until shrimp are just done and pink. Do not overcook. Garnish with additional fresh coriander or parsley if desired.